This happened today, Friday 20 November 2015. 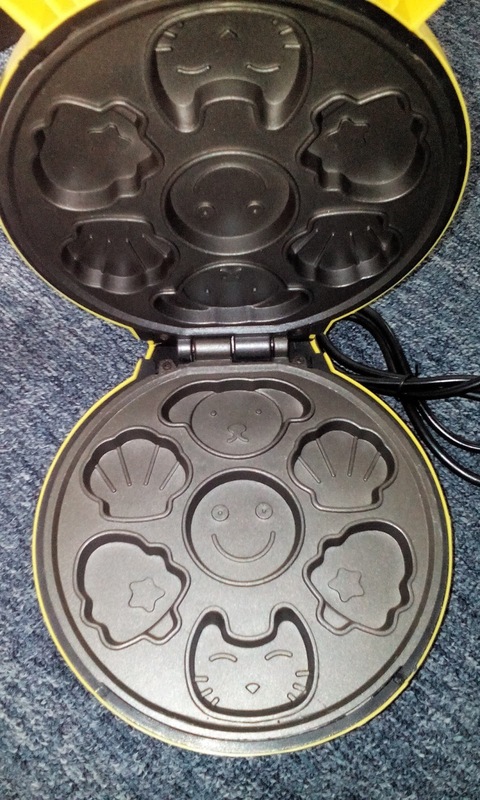 I ordered this Mini Cartoon Waffle/Cake Maker from Lazada on Wednesyday, 18 November 2015. Normal price for this item isRM99 but the price was slashed to RM55. I thought it was a good bargain. 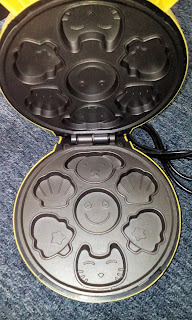 Instead of choosing the normal and typical square waffle maker, I thought this item is cute and I bet my kids would love having cartoon shaped cakes. I paid RM56.70 inclusive of shipping. The item arrived today, Friday 20 November 2015. 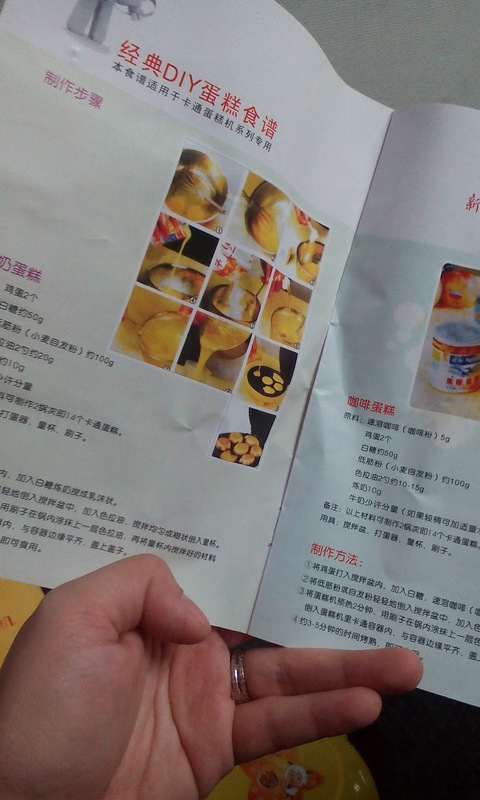 I opened the parcel. I took the item out of the box. 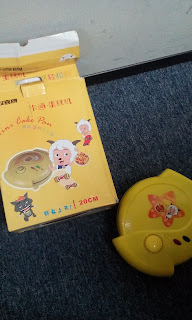 Looking at the box, I knew it's some cheap China-made electrical device. Even the manual book is in Chinese. The only consolation is that they provided an adaptor. I was curious (and furious) looking at the item so I tested it on. OK, the lights came on. Btw, the knob doesn't serve any purpose at all. So the item worked (I guess) because there was heat. However it emitted a funky electrical smell like some wiring or something burning. I turned off the item. 10 minutes later, it was still hot as heck, even the yellow plastic body. 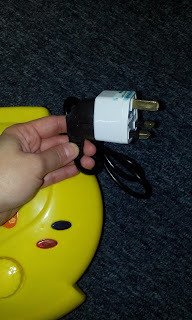 I told myself, that's it, no way I'm taking this item home with me and risk burning my house down or risking a short circuit. I have a freezer full of frozen breastmilk, mind you! So I quickly got back on Lazada and searched how to return my item to get a refund. No time wasted. 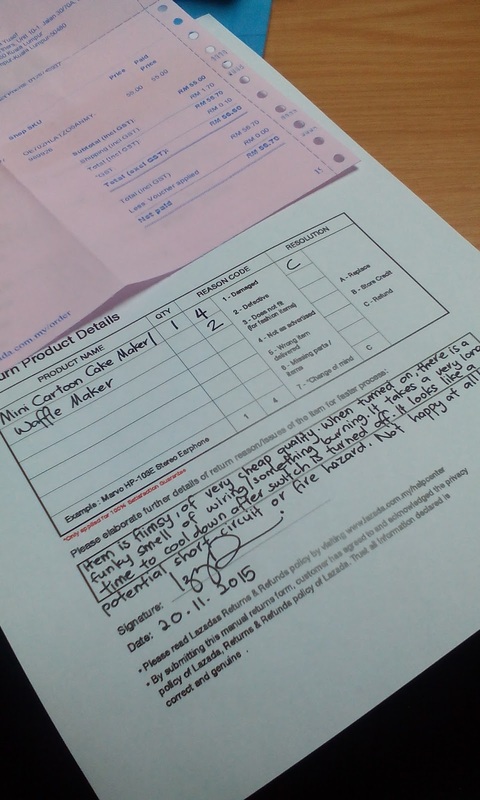 I was given the manual return form because for some reason there was no 'return' button on my order tab so whatever. I filled in the form and quickly went to Mailboxes near my office to post the item. FYI, you can return your Lazada purchases at any Mailboxes for free. Yeah, I just found out about this too. Lazada customer service representative didn't even inform me of this important info pffft. Anyway, I hope to get my refund next week. I guess no cutesy cakes for my kids just yet. I have purchased several items from Lazada previously with no problem. However this time around, luck was not on my side that I purchased a bad item. Honestly, I've heard mixed reviews from Lazada. Good thing I can return and get a refund! I submitted a review on Lazada on this item for one star and I hope they will approve my comment. Have you experienced any bad services from Lazada?